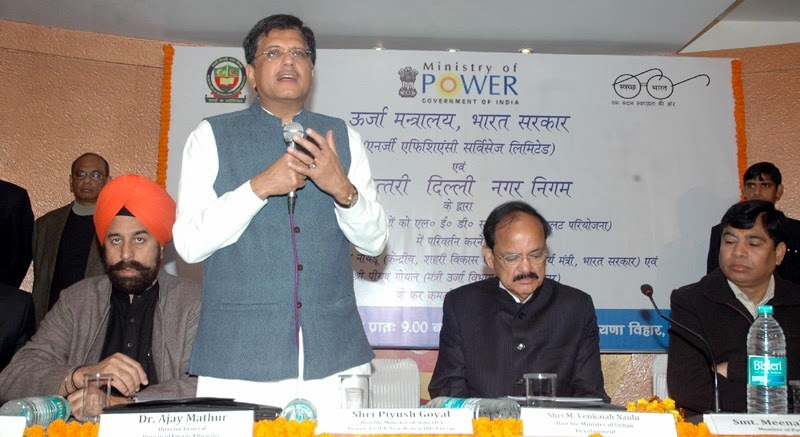 The Minister of State (Independent Charge) for Power, Coal and New and Renewable Energy, Shri Piyush Goyal addressing at the launch of the LED based Energy efficient smart street lights in MCD, in New Delhi on December 20, 2014. The Union Minister for Urban Development, Housing and Urban Poverty Alleviation and Parliamentary Affairs, Shri M. Venkaiah Naidu is also seen. 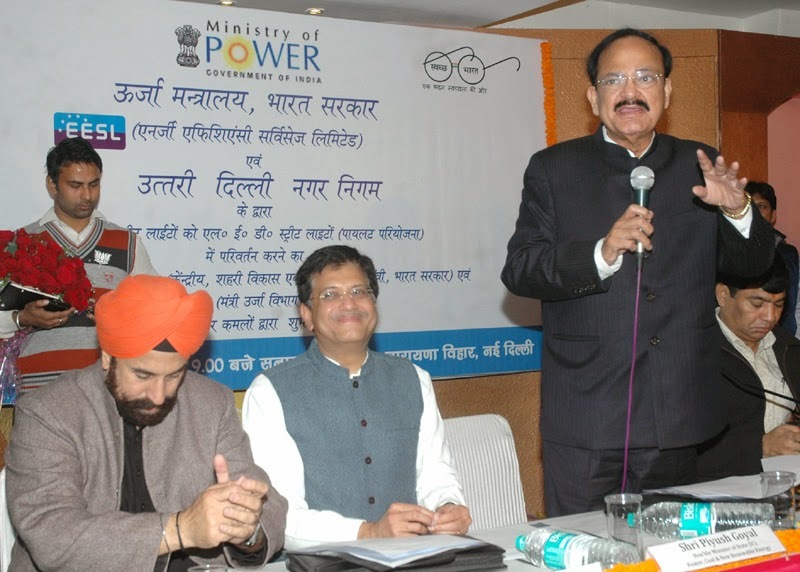 The Union Minister for Urban Development, Housing and Urban Poverty Alleviation and Parliamentary Affairs, Shri M. Venkaiah Naidu addressing at the launch of the LED based Energy efficient smart street lights in MCD, in New Delhi on December 20, 2014. The Minister of State (Independent Charge) for Power, Coal and New and Renewable Energy, Shri Piyush Goyal is also seen. The Union Minister of Urban Development Shri M.Venkaiah Naidu today launched LED based energy efficient smart street lights in the national capital today. The launch programme, held in Naraina Vihar, was also attended by the Union minister of State (I/C) for Power, Coal, and New and Renewable Energy Shri Piyush Goyal. Speaking on the occasion, Shri Naidu said it is a good initiative to reduce electricity consumption in the city, and it will help in improving the financial health of various municipal corporations in the national capital. He said that supply of 24X7 electricity is one of the major components of the smart cities, being envisaged and planned by the Central Government. The smart city requires smart leadership as well citizens, and this has to be based on sense of responsibility and transparency. Shri Naidu said the creation of infrastructure for smart cities requires huge amounts, and this can only be achieved through Public-Private Participation. He said that there is no dearth of intellect, skill or willingness to work hard among the people of India, and there is need to harness the potential to take India to the path of progress, development and prosperity. The Minister said that with the new Government, atmosphere of confidence and trust has come, investments have gone up, and there is enthusiasm among the people. He said the Government is committed to work for development and betterment of the masses. Union minister of State (I/C) for Power, Coal, and New and Renewable Energy, Shri Piyush Goyal speaking on the occasion, said that Delhi should become a model city. He said with the installation of energy efficient LED lights, and there will not be any financial burden on the corporations. He said that within one and a half years, about 25 crore units of electricity will be saved. The Minister also mentioned that his ministry has introduced the Electricity Amendment Bill in Parliament which would permit the consumers to choose their electricity supplier, and this competitiveness would benefit mostly the people of Delhi and Mumbai. There are an estimated 5 lakh street lights in Delhi owned by state government agencies, in particular MCD, PWD. All these are conventional street lights and consume more than 400 million kWh of energy every year. In addition to consuming high levels of energy, these street lights require substantial annual maintenance cost which is around 25% of the energy bill every year. LED Street light consume almost 50% less energy as compared to the conventional street light and they have also have very long life which reduces maintenance cost considerably. LED luminaries also enhance light levels as compared to conventional lights which results in better light output on the street. The use of LED street light would reduce the energy consumption by 50% in addition to reducing maintenance cost to a very low level. Most of the street lights are presently being operated manually. The automatic control of street light would enable MCD to optimise the usage of street lights based on the actual highlighting requirements and taking the benefit of day light. It is expected that the present usage of 11 – 12 hours every day would be reduced by 10% by taking into account daylight savings. These smart street lights also have the feature of dimming during off-peak hours. These features are expected to enhance the savings of energy by another 10 to 15%.